Beautifully furnished unit overlooking lake and golf course in this light and bright, condo with resort style living at it's best! Unit features 2 bedrooms, 2 bathrooms, open plan, laundry area, screen lanai. Master bedroom with King size bed, TV, walking closet, on suite bathroom. 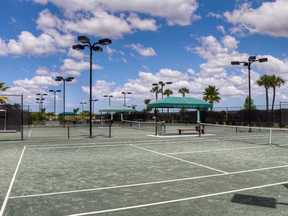 Membership transferable for a low fee of $200.00 in this community so enjoy all that Florida living has to offer from golf and tennis to the state of the art fitness center, resort style pool, spa, restaurants, bars, fishing, and so much more. River Strand is conveniently located near Lakewood Ranch, Downtown Sarasota, Bradenton, beaches. An hour or less from St. Pete, Tampa, Clearwater, and Ft. Myers! Offer monthly, annual, pets OK with owner approval. Welcome to Paradise!!! It just don't get any better... Welcome to Paradise!!! !